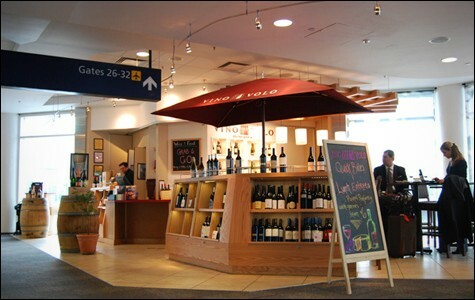 An elevated airport drinking experience at Oakland International's Vino Volo. 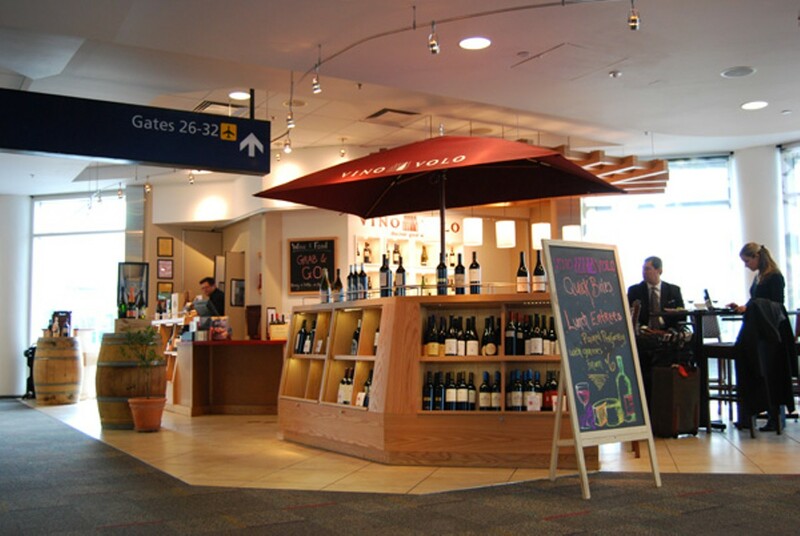 Vino Volo's Oakland Airport location offers wine by the glass, bottle, and flight. Sun.-Fri. 10 a.m.-9 p.m.; Sat. 10 a.m.-7 p.m. The weird thing about airport bars is that if you think about it, no one actually wants to be there. Unlike normal bars, you don't seek them out by choice — you go there to kill time, or because your flight is late, or to numb your nerves in the face of untimely death/five hours without Internet. (Or, more to the point, because you're an alcohol columnist who, by virtue of poor planning and a stubborn unwillingness to take a week off from writing, has found herself in the position of choking down a wine flight and plate of olives on the way back from a stomach- and liver-obliterating New Orleans vacation.) For this reason, these places have basically no incentive to be good. And until recently, they weren't: plastic cups, warm beer, crappy chairs, reheated/fried/unrecognizable foodstuffs, prices bordering on highway robbery. It's amazing what you can get away with when your audience is literally captive. Vino Volo (Italian for "wine flight"; cute, right?) prides itself on its selection, which is truly impressive: vast, well-chosen, and worldly, with an admirable emphasis on small and local vintners. Wine is sold by the glass or bottle, or as part of a three-piece tasting flight, for prices neither cheap nor criminal (typically around $10 a glass). And because the bar is past security, if you like something you can take a full or half-size bottle of it along with you. We tried a flight of Pinots, served on a cute little metal tray with tasting notes underneath, plus a cute schematic placing each wine somewhere within one of four quadrants — "bright," "red," "brooding," and "light"; Vino Volo, it appears, adopts all the preciousness of any wine bar, for better or worse. The wine itself wasn't mind-blowing, but it was more than just good, and definitely head and shoulders above the lukewarm $8 (!!) Sierra Nevada I had a few stands down. There are also Mediterranean tapas-style bar snacks available — warm, rosemary-dusted marcona olives ($4); chickpea-chorizo chili ($7, $12); herby, house-cured olives ($3) — most of which are mercifully available in both small and large sizes to accommodate weird, travel-addled eating schedules, and all of which sounded delicious. The bar itself is made of real wood, the chairs of a believably rattan-looking plastic, the playlist of a well-curated selection along the Ella Fitzgerald-John Mayer axis of downtempo pleasantness, and the staff of actual wine enthusiasts and experienced industry types. If you manage to tune out the loudspeakers and keep your head facing the well-stocked bar, it's actually possible to trick yourself into thinking you're not even in an airport — or, at the very least, that you're there because it's nice, not because you're desperate. There's surely an altitude joke to be made here somewhere.